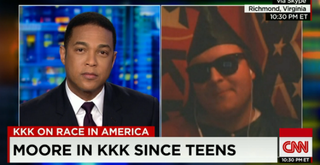 On Wednesday night Don Lemon interviewed a Ku Klux Klan leader—and, well, it went pretty much as you would expect. Lemon was interested in talking about the white supremacist’s thoughts on the outrage about the notorious video of now-former members of Sigma Alpha Epsilon fraternity at the University of Oklahoma singing a racist chant. “You understand there’re black fraternities because blacks could not get in white fraternities?” Lemon countered. “Well, whites can’t get into black fraternities,” Moore replied. “Why can’t we have our own? That’s a double standard. “We have the right to associate with whoever we want to; we believe in a freedom of association. If people want to have integrated fraternities, let them do it. But what’s the crime in us wanting to have all-white fraternities just, like there’s all-black fraternities?” Moore added. Moore went on to quote Scripture to argue for the separation of the races before taking a dig at Lemon’s own biracial identity. “You yourself are mixed, so we’ll see what happens to you,” Moore said.